Quiet week - actually quieter than I'd like, but that's how it works sometimes. Things started off well enough, with Closed Circuit on Monday - not a great movie, but decent enough. It was odd watching it after pulling the first couple episodes of Silk off my DVR; the set for the main courtroom at the Old Bailey looked identical, and both had this American having a little bit of a difficult time puzzling out the British legal system. All the British mysteries and Law & Order: UK and Rumpole I've seen, and I'm still not quite sure what a solicitor does. Even though I've got a ticket stub for And While We Were Here for Tuesday, I opted not to put it in the scrapbook since the 7:30pm show was done by 7:45. It was a weird situation where all the music and background noise was coming through, but none of the dialogue. At first, I thought it was a stylistic choice, but soon it became clear that it was a technical problem. I used to have the same thing happen with my DVR, and sometimes a reset would work, but the folks at the theater weren't going to go nuts with $4.75 worth of ticket revenue on the line. Annoying, but I wasn't in position to ask a whole lot. It gave me the chance to listen to the Red Sox game with Pedro Martinez in the radio booth, and that's always great. Later in the week, I hoped to see Fruitvale Station at the Capitol. Never managed to make the 6:15pm show, though. After that, it was the weekend, and Films at the Gate time. 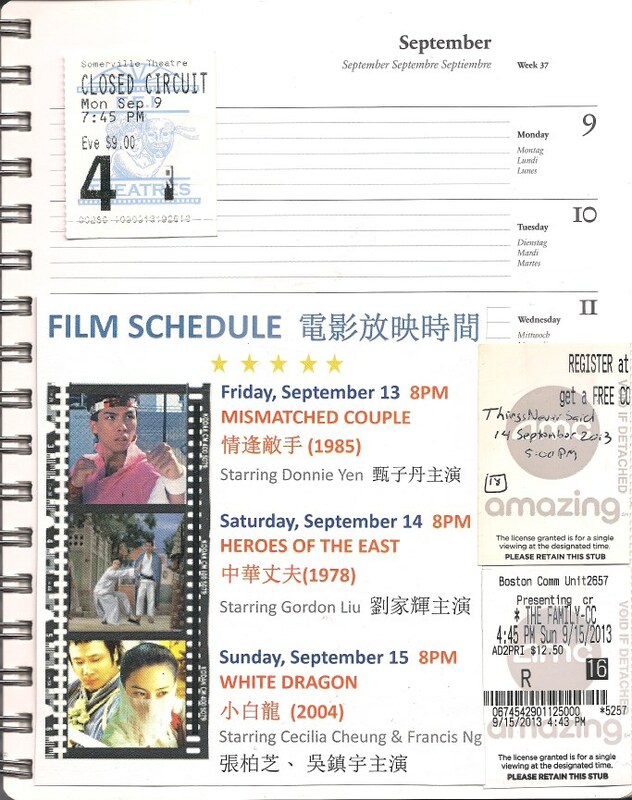 It was a fun series this week with a couple of neat surprises, although it wasn't until midway through the third movie that I realized that there was a kung fu romantic comedy theme going on with Mismatched Couples, Heroes of the East, and The White Dragon. Since Boston Common was nearby, I opted for double features on the weekend, and was pleasantly surprised to have a guest in the theater for Things Never Said on Saturday. Neat happenstance, that, as I only saw that because I had MoviePass issues for the show fifteen minutes earlier. No worries, though, I could see The Family on Sunday, which was not a great decision. Ah well. The week after has already started out well and looks like it could be a good weekend.